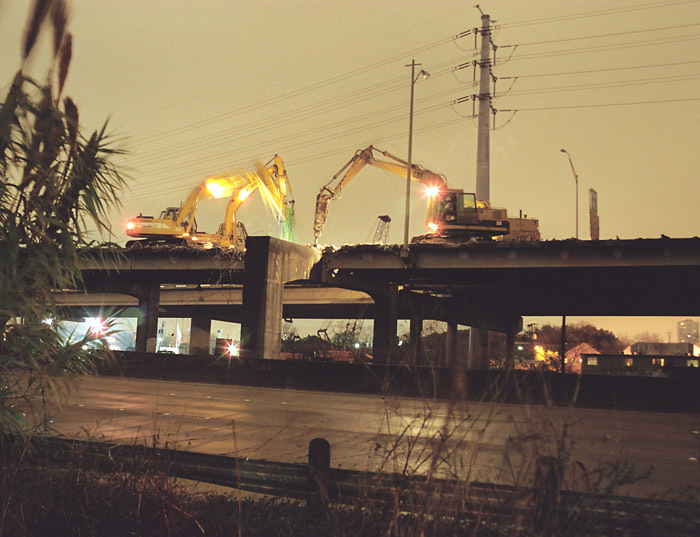 The demolition of US 59 (the Southwest Freeway) and Spur 527 began the night of Friday February 13 after a favorable court ruling the preceding Monday. 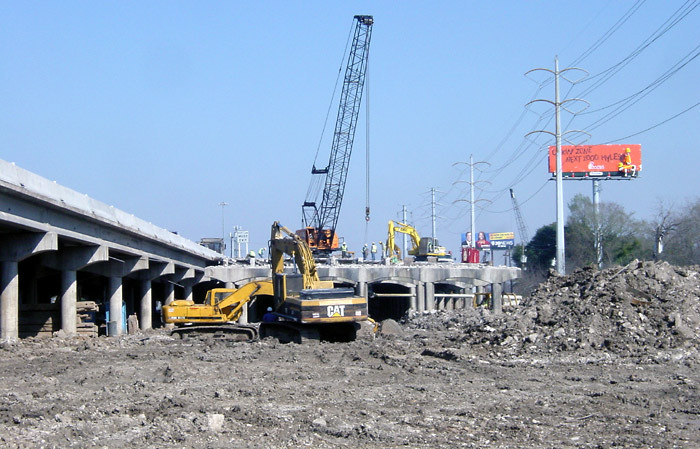 The connection ramp to Spur 527, commonly called the "downtown split", was gone by Saturday February 14. 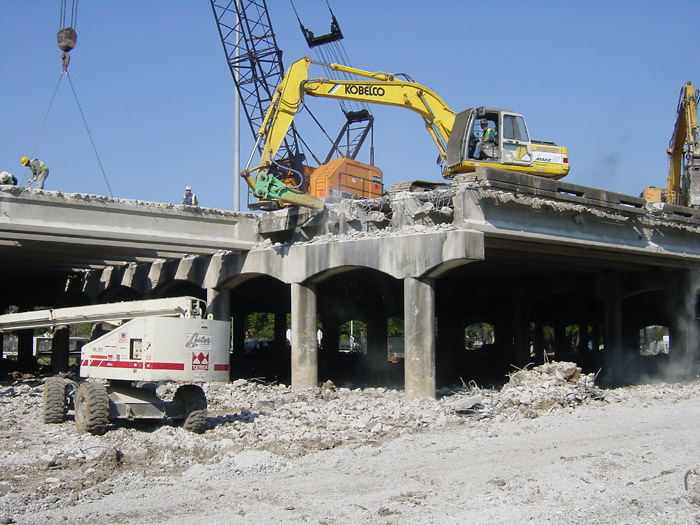 Traffic was shifted to the north side of the US 59 elevated structure and demolition of the south side of the elevated structure began. As of February 27, demolition was about 50% complete. 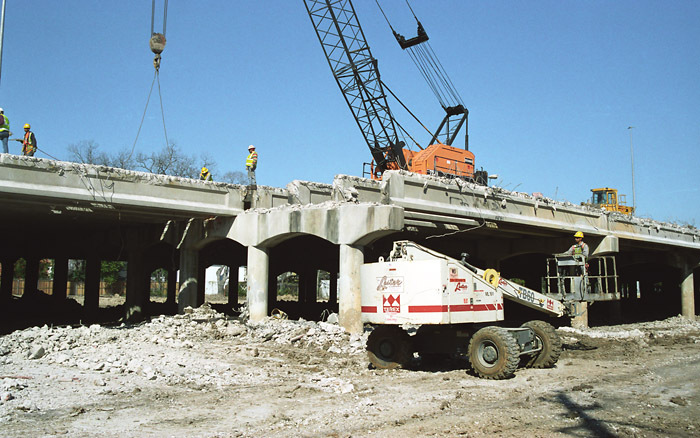 (2004-02-13) This view shows the Spur 527 connection ramp in its final hours. 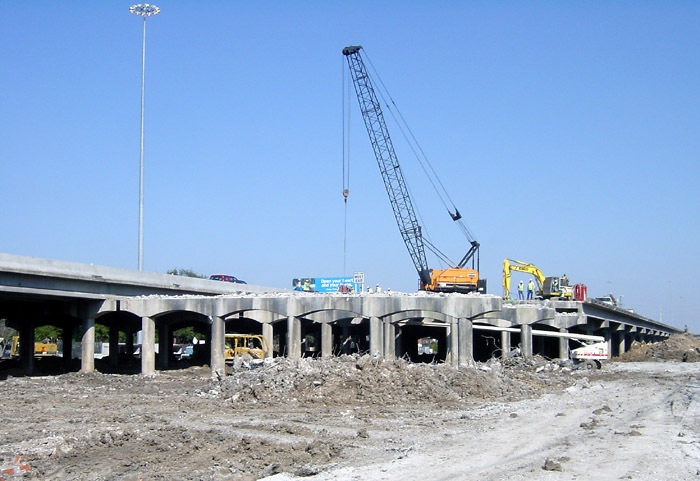 The excavator-crawlers on the ramp are equipped with jackhammers which broke up the concrete. The noise from the jackhammers was deafening. It's a good thing the demolition was a one-night event, otherwise I think there would have been a revolt in the nearby neighborhoods. (2004-02-13) Another view of the jackhammers. 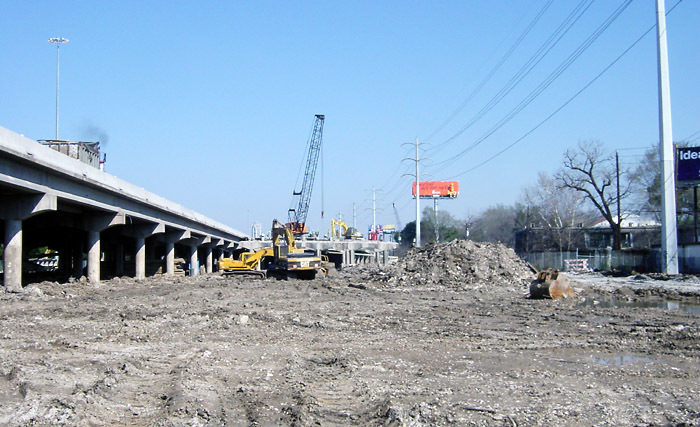 (2004-02-13) This view looks west along US 59 at the Spur 527 connection ramp, which was in the process of being demolished at the time of this photo. 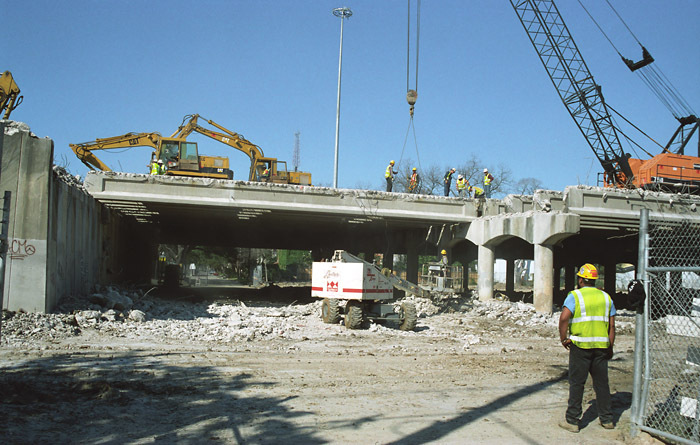 (2004-02-17) A few days later work was in progress to demolish the US 59 elevated structure. 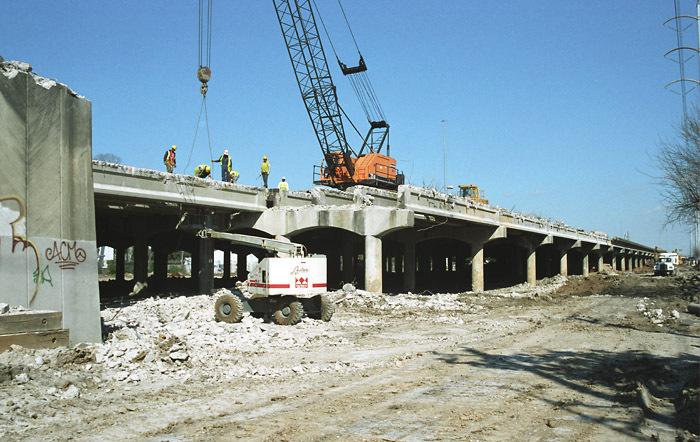 This view shows the first section to be removed. (2004-02-17) Another view on February 17. 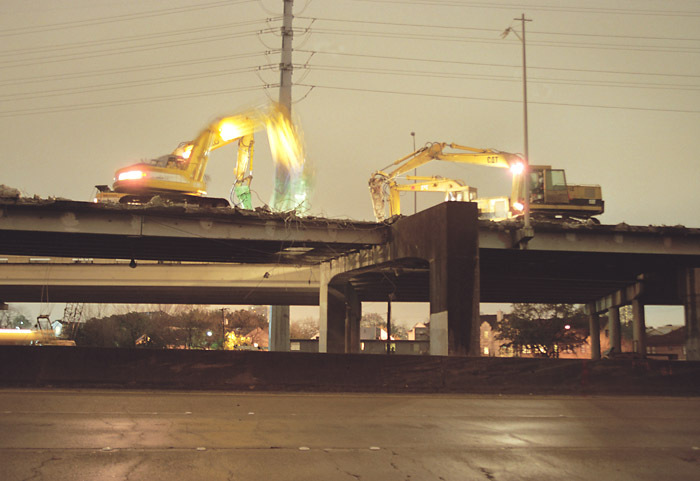 (2004-02-26) By February 26 demolition of the south side of the elevated structure was about 50% complete. 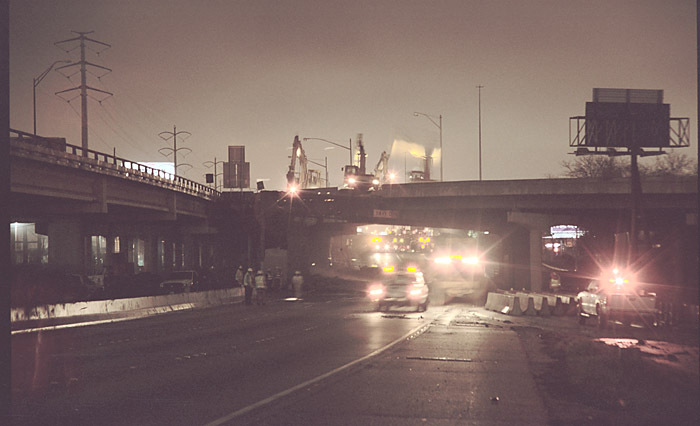 The location of this photo will be excavated to put the freeway into a trench. (2004-02-26) A zoomed-in view along the cleared zone. (2004-02-26) A look at the section where demolition was in progress. 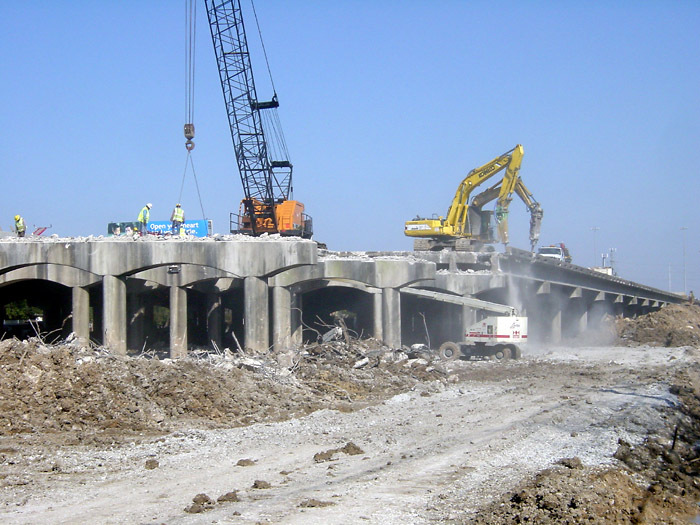 (2004-02-26) A closer view with the jackhammers breaking up the guardrail. (2004-02-26) A very close view. (2004-02-26) This view looks east from the Mandell overpass. 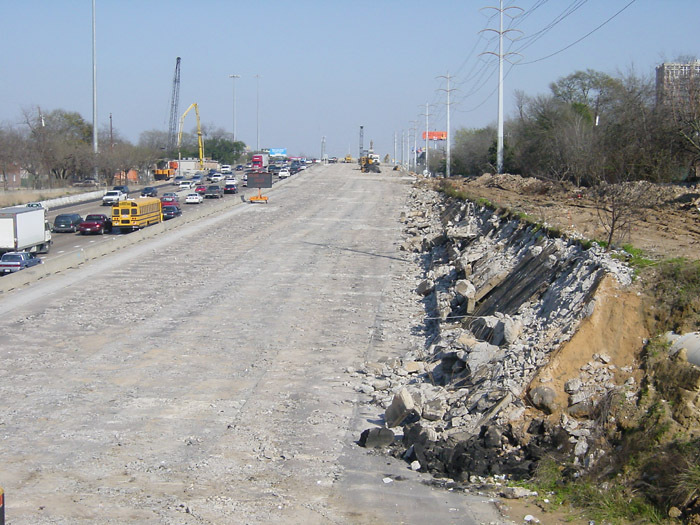 The freeway concrete has been broken up and will be removed soon.